February 18, 2011 – Superior Helicopters Canada Inc., a wholly-owned subsidiary of Discovery Air Inc.’s Great Slave Helicopters Ltd., has been awarded a new two-year contract with the Ontario Ministry of Natural Resources (OMNR). The contract with the OMNR is for three Bell medium helicopters for aviation, forest fire and emergency services in Northern Ontario, with the three contracted machines based in Wawa, Chapleau, and Cochrane. Commencing April 1 and spanning two fire seasons to March 31, 2013, the new contract is based on utilization but will result in minimum annual revenues of approximately $1.5 million. 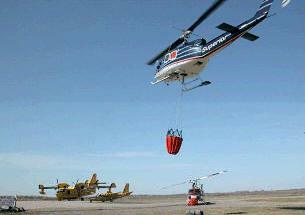 In addition to Ontario, Great Slave Helicopters, its subsidiaries and aboriginal partners currently service forest fire contracts in Alberta, Manitoba and the Northwest Territories, and provide back-up support in B.C. and Yukon. Founded in 2004, Discovery Air Inc. is a specialty aviation services company operating across Canada and in select locations internationally. With over 130 aircraft, it is one of the largest air operators in Canada, employing 450 flight crew, maintainers and support staff to deliver a variety of air transport, maintenance and logistics solutions to a wide range of government, airline and business customers. The Company’s Government Services segment includes three subsidiaries: Top Aces, which delivers airborne training and special mission services to the Canadian military; Hicks & Lawrence, a supplier of airborne fire management services to the Ontario government and charter services to government agencies and corporate customers; and Discovery Air Technical Services, which provides a range of maintenance, repair and overhaul solutions to customers from its Quebec City location. The Company’s Northern Services segment includes three subsidiaries: Great Slave Helicopters, the second-largest VFR helicopter operator in the country; Air Tindi, the largest fixed-wing aircraft charter provider based in Northern Canada; and Discovery Mining Services, which constructs and rents all-weather exploration camps and provides expediting and logistics support services.